We’re oenophiles. Not only do we love tasting and learning about wine around the world, wine is one of our favorite souvenirs to bring home from a trip. Wine can be delicate to travel with and you never want to arrive home to your clothes stained burgundy from a broken bottle of red. Traveling with wine is actually a lot easier than you think, though. Can you bring alcohol on a plane? Absolutely, but only in checked baggage unless you’re purchasing it from duty free. After years of flying with wine ourselves, we’ve put together our tips for how to pack wine in luggage and everything you need to know about how much wine you can bring back. Rule 1: you cannot take alcohol in hand luggage. This might seem blatantly obvious, but too many travelers overlook the fact that you can only travel with wine in checked luggage. Whether it be nostalgia for the days before 9/11 when you could carry bottles – or even cases – of wine on the plane or just total lack of awareness of the TSA prohibited items list, we still see far too many distraught travelers reluctantly handing over their bottles of Dom Pérignon for the TSA agents to drink later. Or worse yet, travelers standing on the other side of the ropes while they guzzle their bottle before boarding the plane. Liquids in containers larger than 3.4 ounces are prohibited to take in your carry-on bags, with the exception of wine and spirits purchased in duty free shops after passing through security. Just be aware that if you are making a flight connection in which you’ll have to re-enter security, you may not be able to bring duty free wine through with you when re-screened. This happens particularly if you are flying international and then connecting to a domestic flight. Bringing wine into the US on the plane is easier than you think, though, and you have a couple of options for flying with alcohol. If you only plan to bring back a couple of bottles, there are various types of wine bottle packaging you can purchase ahead of your trip. A wine travel bag or wine bottle protector is designed to add some cushion around the bottles, and the best ones seal and are leak-proof. If you’re planning to bring back a larger amount of wine than just 2-3 bottles, consider investing in a wine suitcase. These suitcases are designed specifically to fit and protect 12 bottles of wine. Consider checking a case of wine as luggage. It’s treated as any other checked baggage and the winery often will package it up for you with the same protective materials they use when packaging wine for shipping. Champagne in checked luggage also isn’t a problem. Many travelers are concerned about whether the pressure affects champagne and you can rest assured that even the cargo holds on planes are pressurized. Even though the plane’s interior goes through small cabin pressurization changes that can make your ears pop or cause a bottle of shampoo to occasionally pop open, champagne bottles and their corks are built to withstand far more pressure. One last thing. It should also go without saying that you must be 21 years of age to bring alcohol into the US, even if you are only bringing it as a gift. 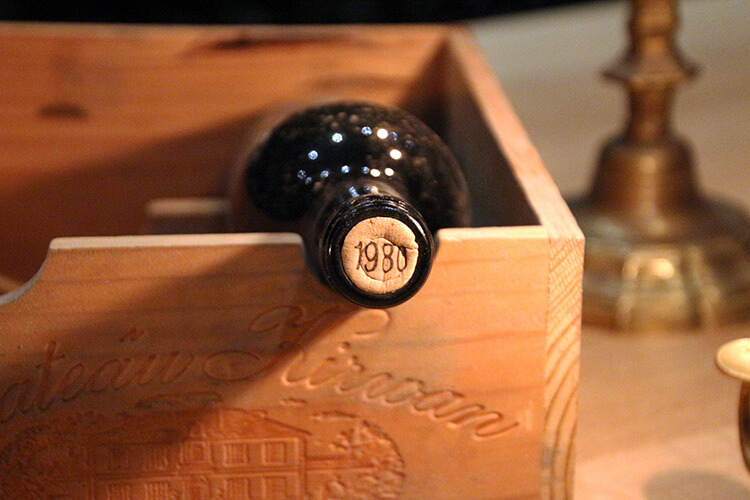 How Much Wine Can You Bring Back into the USA? alcoholic beverages that contain less than 24% alcohol have no limit. So how much wine can I bring back from France then? Great news: as much as you want! Nearly all wine contains less than 24% alcohol, so there is no TSA-regulated quantity limit for the amount of wine in your checked bag for personal use. Just always be sure to check the TSA website for any changes to this policy before you travel. Individual airline baggage weight limits still apply, but you can use up your entire weight allotment for wine if you chose. It’s good to know that one bottle of wine weighs approximately 3 pounds, though it may vary slightly since some winemakers use heavier bottles. The challenge of packing wine in your checked luggage is making sure you don’t end up with 750 milliliters of Chianti on your clothes. Wine bottles can be delicate and luggage handlers generally don’t handle your luggage with the utmost care. Your luggage is likely to get tossed, jostled, and probably will end up shooting down onto the conveyor belt upside down and backwards. As frequent travelers flying with wine, we’ve tried it all and have yet to arrive home with a broken bottle. When we’ve not planned in advance to bring wine home, wrapping one or two bottles up in something unimportant like pajamas, socks, and t-shirts does the trick. Just be sure to nestle your bottle into the middle of your suitcase and cushion it as best as possible. You might even want to add a little extra protection like placing it inside a plastic shopping bag or the plastic laundry bag from your hotel room just in case. It’s really best to be prepared with wine sleeves for airplane travel, though. There’s many brands making these wine bottle travel protectors these days and it’s super easy to order them on Amazon. Many wineries often sell wine bottle bags in their shops too, but you’ll pay a higher price than if you just ordered them and brought them along with you on your trip. They’re flat and weigh next to nothing, so there’s no reason not to just pack them and save that extra money to spend on wine. We particularly like the brand WineSkin. They’re basically bubble wrap wine bottle protectors that are a special leak-proof vinyl bag specially contoured to fit 750 mL bottles of wine. The have an adhesive seal and will keep your bottle safe and the rest of the contents of your suitcase dry just in case the bottle does break. WineSkins are sold in 2-packs, 4-packs or 6-packs and are often even available in wine shops if you haven’t ordered some in advance. If you’re bringing back more than just a couple of bottles, consider purchasing a wine suitcase like the Vin Garde Valise Grande 04 Wine Travel Case. It’s a spinner hard shell suitcase with specially designed compartments to hold up to 12 wine bottles of any shape or 10 wine bottles and two champagne bottles. When fully packed with 12 bottles, it comes in weighing between 43-49 pounds and under the checked baggage weight limit of 50 pounds for most airlines. When you’re not using it for packing alcohol in luggage, it can be used as a regular suitcase. 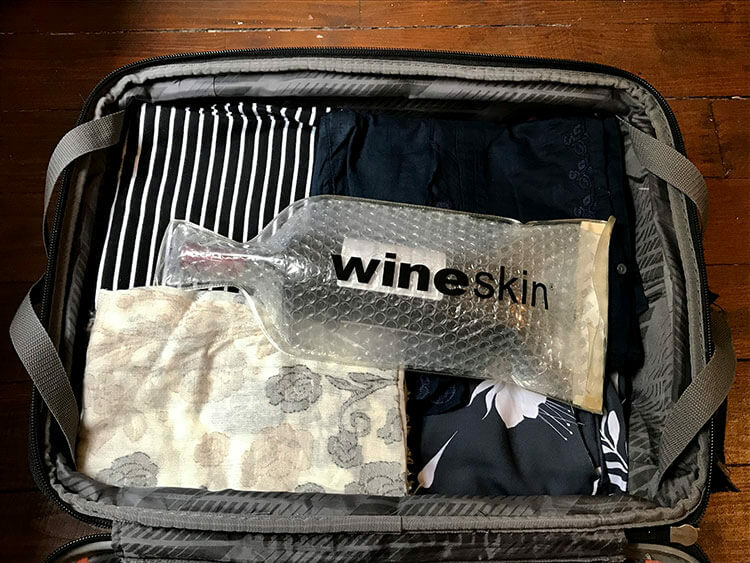 Even with a specially configured suitcase for packing wine, alcohol and other bottles like balsamic vinegar, you might want to consider adding extra protection by securing the bottles in WineSkins. Most airlines treat cardboard boxes just as they would a suitcase. It shouldn’t exceed the weight limit (typically 50 lbs for most airlines) and should clearly display your name on the outside of it. Many wineries, particularly if they ship their wine, have packaging materials on hand and will either just package it all up for you at no extra charge or will only charge a small fee for the packaging materials. Wine cases for shipping have separators and bottle protectors that will help keep your wine safe during your flight home. Marking the box fragile really won’t help. Most airline baggage handlers say that they rarely notice those stickers, so you want to make sure it’s all packaged up really well. Write all of your information on the outside of the box, including your flight number. Then simply show up at check-in, place it on the scale and pay any additional baggage fees since the case of wine presumably isn’t your only piece of checked luggage. Some airlines will let you check a case of wine for free, like Alaska Airlines’ Wine Flies Free program. Alaska Airlines allows Alaska Mileage Plan members to check one case containing up to 12 bottles for free when departing from 29 airports in Washington, Oregon, Idaho and California wine regions. So be sure to ask about any airline loyalty perks either before you fly or once you arrive at the airline check-in counter. If it all still seems like a hassle, inquire with the wine shop about shipping options. 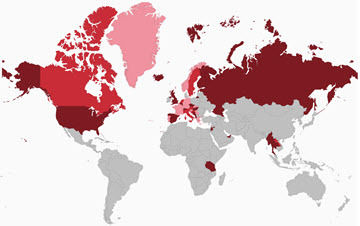 Many wine shops and wineries will ship wine direct all over the world. They’ll take care to package it all up properly and your wine will arrive at your home without the weight and hassle of having to get it there yourself. This article contains affiliate links. When you shop on Amazon through our affiliate links, we earn a small commission at no additional cost to you. Thanks for sharing the info, Jennifer. WineSkin is great! I’ve never seen it before. Will keep in mind. 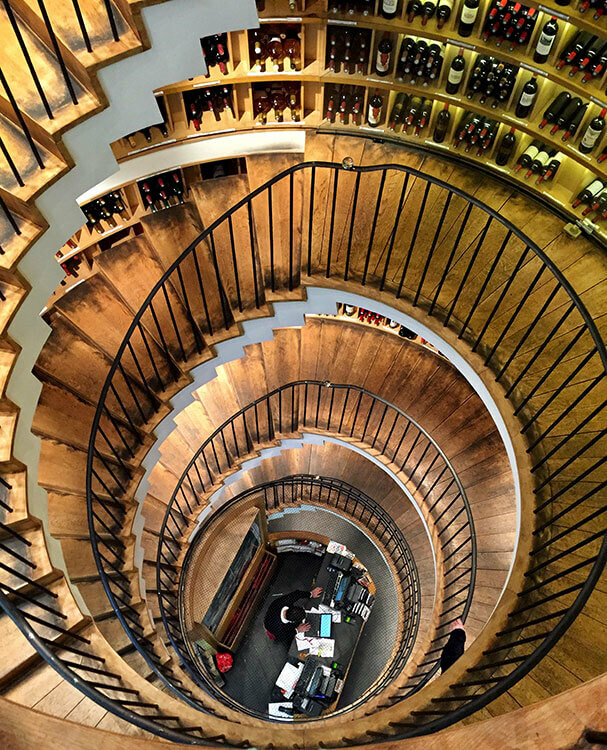 We’ve just started seeing WineSkin more and more in shops around Europe. A winery we recently visited in Greece had them for sale for €3 each. But you can get a good deal if you order in advance from places like Amazon. Great idea. Since we cannot ship wine to Erie the wine sleeve is a great idea. Didn’t know about the wine skin but now I do! It would be a disaster if your wine bottle gets broken in your luggage! Yes, that definitely would not be good! We’ve had luck in the past with wrapping in clothes or having the wine shop bubble wrap or box wine for us. But we like a little extra reassurance. Since WineSkin is so easy to pack, it gives us that. This is very important advice! Thanks…. This post totally reminded me of when I brought 8 bottles of wine back from Australia – in my carry-on in 2005 (they actually didn’t put the liquid limitations in effect until several years after 9/11). One thing people need to keep in mind, though, is that there are customs limits on how much alcohol you can bring into the country without paying duties on it. I remember looking at the rules extensively when I brought my wine back from Australia and decided it was a low enough charge that I would just deal with it – in the end, the customs guy barely glanced at my form and ignored the fact that I declared 8 bottles. Different US states also have rules about whether you can ship alcohol into the state, so people should check those before shipping anything. I remember deciding against shipping because it appeared I couldn’t legally ship wine into Illinois. Great points, Katie. Yes, there are still state regulations and taxes for what you bring in. And you should always be honest about what you are declaring as there are hefty fines if you aren’t honest and are caught. I totally remember the days when you could carry alcohol on the plane. I think it was also 2005 when we brought back bottles of rum and the like, carried on the plane in a box, from St. Maarten. You’d be surprised about the shipping. Some wine shops even ship for free. They have to acquire special licenses to export alcohol and often have negotiated special shipping terms. Great to know! I love wine as well. I saw you’re going to SE Asia soon. Are you also going to Hong Kong by chance? If so, there’s an amazing winery there – they make wine on the island, but they import the grapes from the Pacific Northwest and other great wine regions. I can’t remember the name for sure, but if you’re going, I’ll certainly find out! The winery in Hong Kong sounds great! We’ll only be going to Thailand and Myanmar on this trip. But don’t be surprised when I come knocking for that info when we do make it to Hong Kong! This post was made for me!! I usually just shove the bottle in my backpack and hope my clothes will keep it cushioned…! The great thing about WineSkin is it is light weight, easy to shove in any kind of bag, and will protect your wine. Plus they’re reusable, so always a win! I like the WineSkin idea, I haven’t seen those before. Unfortunately when I travel around Europe, it’s usually only with a carry on luggage so I can’t bring any of the good stuff home with me. We travel carry on most of the time too, though we’ll check a bag on the way home to be able to bring home wine. There’s definitely been times where it just wasn’t possible to bring any home though, like from my trip to Napa Valley. My only advice is to be very certain that you know all the rules. For instance, I didn’t know that I would have had to arrange the customs paperwork in advance. How would I know that when I was buying my wine spur of the moment? Personally, I will never have wine shipped to me directly again. Better off sneaking it in suitcases. Guess you guys in US don’t have to put up with all that government crap? That sounds like a pain for Canada! We don’t know about the shipping rules regarding alcohol outside of the US, so thanks for the reminder for any other Canadians reading this! Regulations on shipping vary from state to state, and some states are “dry” states and don’t allow the import of alcohol, like Utah and Pennsylvania. We generally stick to around 3 – 5 bottles to bring home and just do so in our suitcase. The same happens in Brazil. If I have the wine sent direct to my home I will pay 60% of taxes to the government. Better to have them in my checked-in luggage. Right, that's a good point. Some state regulations, like in Pennsylvania, don't allow the shipping of alcohol. Glad to hear your bottle made it safely home, D.J.! We’ve only got room for about 6 more bottles on our wine racks now. Time to order another wine rack or to start drinking more often! Great tips! We've certainly seen a few expensive bottles be handed over especially when people are transferring and thought they were safe… yet to see someone guzzle a bottle on the side though 😉 Love the wine skins, we're going to have to order some of those! Thanks for introducing me to the wineskin. My sister the oenophile just travels with a big-a$$ roll of bubble wrap. Now I have something to get her for her birthday! She sounds serious about getting her wine home safely. Bet she’ll love WineSkin, Don! Oh man! Strawberry wine isn’t what you want all over your clothes. Hope these tips help for the next time you bring some home, Aleah! It's got to be the worst to have your bottle of wine confiscated, especially an expensive bottle! My mum actually forgot when we were in Portugal that she had a nice bottle of port in her hand luggage, I felt soooo awful for her. We just brought four bottles home from Budapest – one in a wine skin and three wrapped up with our dirty laundry. Baggage handlers can be particularly rough in China so we were thrilled not to find our bags leaking red wine on the conveyor belt! Glad to hear your wine made it safely home and that you enjoyed Faust! Gabor is so knowledgable and has the best Hungarian wines. I should get a WineSkin, since I always seem to be traveling with wine. (The only time I check a bag — ever!) There’s just something about bringing home a bottle from a favorite winery and drinking it at home. They all make winery-only bottles, so it is that special. I love it. I agree, Abby! I live bringing home a special bottle to enjoy later. It’s like taking a trip down memory lane to the holiday. Great tips! I’m not much of a wine drinker, but I can imagine Andy wanting to bring back beer at some point. We tend to only bring beer home on road trips. I haven’t checked out any packing options for beer for when we fly. 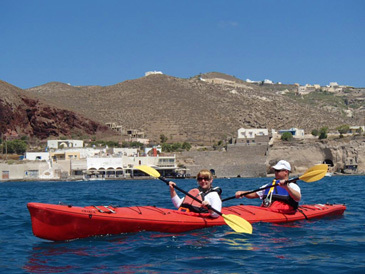 But I would have loved to bring home some Red Donkey from the Santorini Brewing Company in Greece! Just got off the phone with TSA and they report there is a limit of 5L per bag, thus the wonderful 12 bottle winecheck.com shipper I had found won’t work, unless I only fill it with 6 bottles! Hi Vicky! Actually, and I just doubled checked with TSA again to ensure our information is current, there is no limit for the number of bottles or liters if the alcohol content is less than 24%. As nearly all wine contains less than 24% alcohol, you have no limit. The 5 liter limit specifically applies to alcohol between 24 – 70% because it is then considered a hazardous material. Alcohol greater than 70% cannot even be brought into the US. WineSkin looks like a total must-have! Do they deliver to Europe, I would like to send a friend one as a gift! Thanks for sharing! I didn’t know of the existence of wine skin bottle bags. 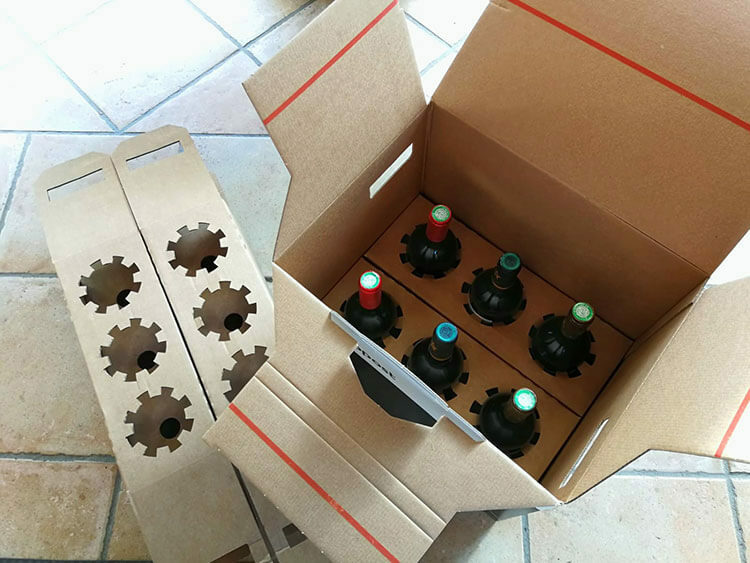 It sounds very clever way to pack the bottles! Glad to find this post! I am going to Italy next month, and I want to bring back wine with me. I’ve never done it before, so your article is super helpful for me. I am going to use any unimportant clothes I have to protect these bottles. I’m glad to know that there are actual packages designed specifically for wine bottles.